Earning your MBA is traditionally one of the best ways to greatly increase your responsibility and income in the business world. But one underserved area that many recently graduated MBAs do not consider is health care. Given the great increase in demand for all types of health care services today, it is only logical there there is more need for advanced business professionals with an MBA. These professionals are in great demand to help to manage all business aspects of health care facilities. In fact, US News and World Report finds that healthcare is the 2nd best type of MBA you can get today. In the state of Massachusetts, there has been an increase in demand for health care services just as in most of the country. This has caused health care salaries to spike, and for MBAs in healthcare, the field in this state is quite lucrative. 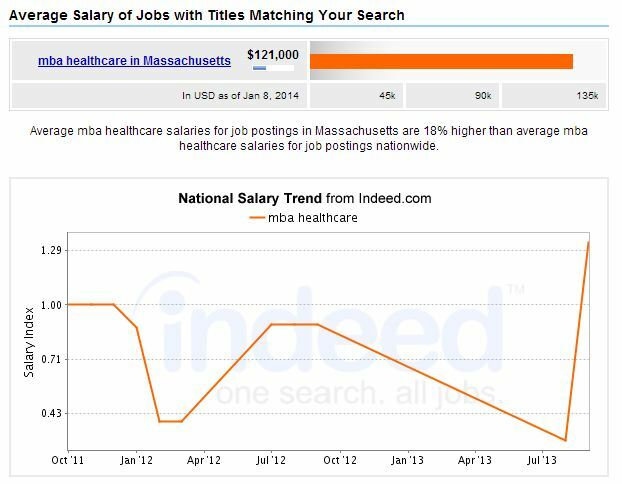 Indeed.com reports that healthcare MBA salaries in this state are 18% higher on average than the US overall. GW’s Executive Master of Health Administration is for aspiring leaders with at least 3 years of clinical or administrative experience in the health care industry. With the program’s interactive design, students learn from each other’s experience as much as they learn from faculty. The curriculum focuses on developing the leadership and ethical skills needed to create highly effective health care organizations, and core health care content areas including quality improvement, decision science, quantitative methods, and community health. The MBA at Harvard Business School is renowned around the world, and you have the opportunity to study not just health care from the aspect of business, but to also study the real leadership in health care that you will need to show to take your career to its highest potential. The general management MBA program at Harvard is combined with Field 3 entrepreneurial engagement strategy that helps you to learn the most innovative types of solutions to health care challenges. This top MBA program is for all types of business professionals, either those with years of business experience, or those who are just beginning their career journey. This AACSB-accredited program offers a Health Systems Management concentration that will give you a deeper understanding of the management and policy challenges in health care services. The online Healthcare Management MBA will allow you to explore the entire evolution of the US health care system. You will look at the latest policies and proposals for health care, and look how the actions that are taken can affect other areas. You will also analyze the business aspects of the healthcare industry, and learn about strategic decision making and strategic formulation. Boston University offers a dual MBA and Master of Public Health in Health Policy and Management. The goal of this very demanding program is to give you a very solid foundation in business management, and also public health in a highly integrated curriculum that focuses on US health care. You will be given a broad perspective of the larger health care system in the US and will learn skills that will help you to manage them effectively. Program: MBA and Master of Public Health in Health Policy and Management. This MBA program offers a specialization in Healthcare Management. The challenges facing health care facilities today are very complex, given many global, social, political and economic changes. This program will teach you how to manage cost issues, access and quality. You will learn how to be highly competent not in just management and leadership, but how to adapt the organization in the face of the tough challenges in the health care field. Harvard Business School (HBS) is making a difference in health care. This video profiles Michael Schrader, MBA 2012 on co-founding Vaxess Technologies out of the Harvard iLab; Dr. Nabihah Sachedina, MBA/MPP 2013 on studying policy and general management at HKS and HBS; Fola Laoye, MBA 1999 on sending Hygeia Group clinician leaders to HBS executive education programs; Stephane Bancel, MBA 2000 on founding of Moderna Therapeutics; and Professors Richard G. Hamermesh and Robert S. Huckman on the HBS Health Care Initiative.